This Certified Scrum Product Owner® (CSPO) training course is an intensive two day workshop on one of the most critical roles defined by the world’s most popular Agile framework: Scrum. We use highly immersive adult learning techniques such as visual modelling, simulations, role-plays and ‘Training from the Back of the Room’ activities to enable self-directed learning and enhanced retention. This course is organised and run using Scrum as a management framework. This allows for feedback and flexibility as well as experiencing Scrum in action throughout the course. The Product Owner role is critical to maximising Return on Investment from agile product development / projects and is one of the most challenging yet rewarding of the agile roles. As the voice of the customer to the delivery team, a Product Owner needs to be able to work effectively not only with end users and other stakeholders but with the team on a daily basis. Release Burndown with scope tracking. The importance of iteration, learning and risk management in product development. What Scrum is and how a Product Owner works in this environment. What a Product Owner does and what it takes to perform the role well. How to create a shared vision. How to create and maintain a healthy Product Backlog. How to manage a Release to a successful outcome using agile techniques. Two full days training with a highly experienced agile practitioner. Full catering during the course including morning tea, lunch and afternoon tea. 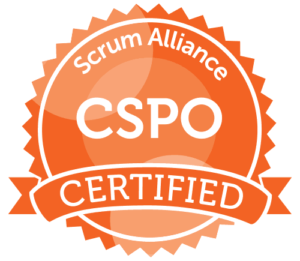 Certification as a Certified ScrumMaster (CSM) for participants who pass the post-course Certification Test taken online with the Scrum Alliance. 2 years of membership with the Scrum Alliance. A letter of course completion that may be submitted to your employer and/or a professional body (PMI, ACS or similar) for PDUs (available on request). To register one or more participants for this course, simply select the “BOOK NOW” button at the top right of this page and complete the registration via our secure booking system.